This is the month of the Full Strawberry Moon, and Jamie Ridler asks her viewers, “What would I love to delight in this month?” Aaaaaaaahhh! Well, it appears I am still trying to figure this out. My dreamboard took a different look at my month ahead. My board reminded me of miracles, to reach high, make choices, to give up my worries, and if I don’t like the directions I’m headed to take a left turn and continue down the road. I am most drawn by the child and the tree, that I can lean, bend, and shape my world if I put my mind to it. I’m so happy to be active with this practice. I’m looking for opportunities to share my process with others. 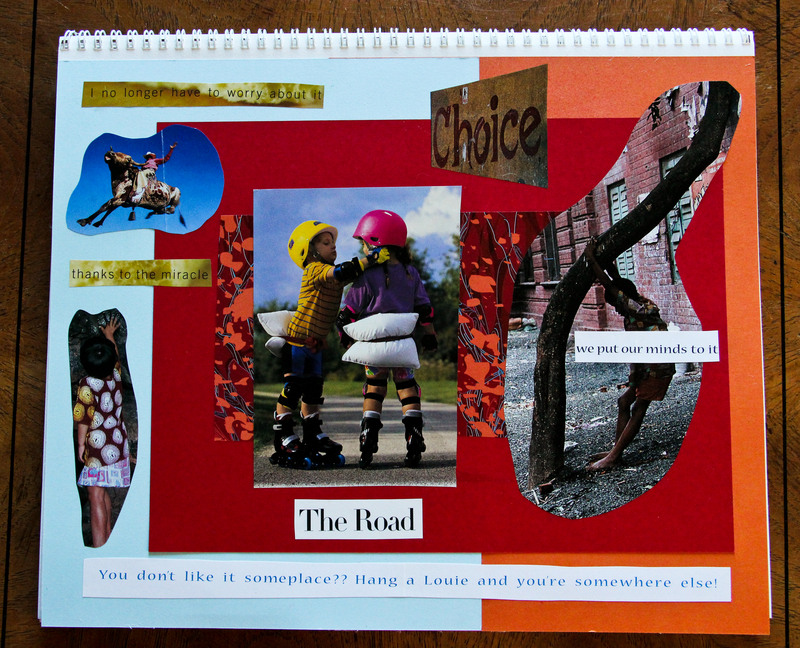 I plan to share my 12 months of dreamboards at the close of the year. I hope you’ve a delightful and healing month of June! Jamie Ridler prompts her viewers that the Full Flower Moon asks: “How would you like to bloom? 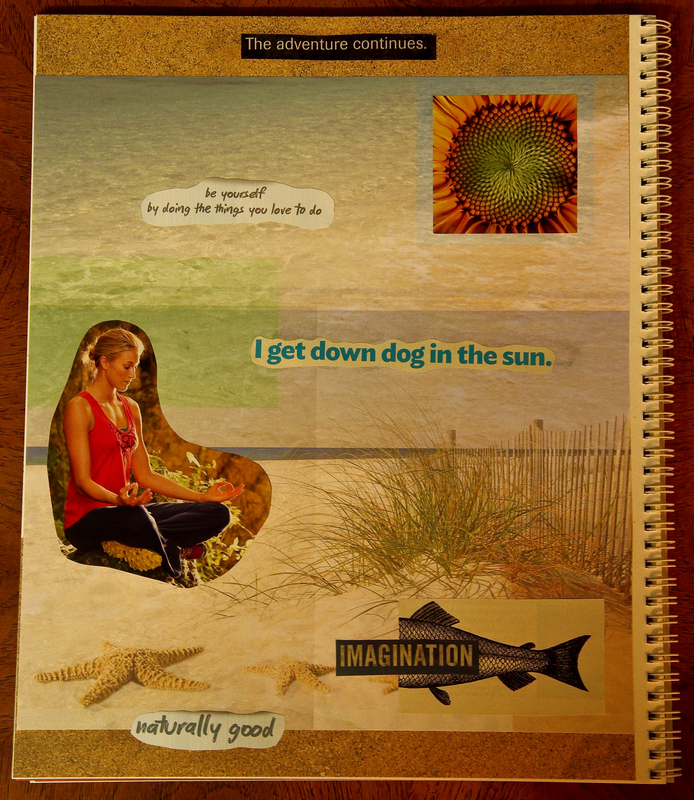 Who are you when you’re in full bloom?” And this month I feel my process did not bring that question to the surface. 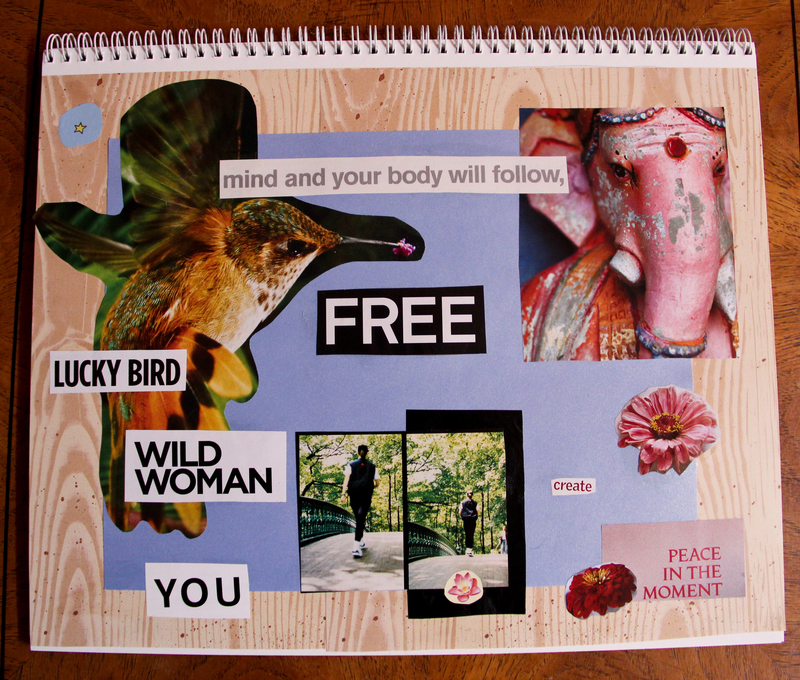 What I do notice in my dreamboard is simplicity and a lot of space. I see I’m being drawn by the idea of summer, space, the beach, and the open feel of imaginative living. I asked a yoga instructor in my community for a private session. I want to develop a home practice that honors my body where it is now. I’ve been coping with injuries and perceived limitations. It messes with my mind and spirit. I am trying to let go, blossom, and unfold. I would like to bloom, like a flower mandala each petal a lesson I can share with others. I am a healer and envision running and owning a healing spa with art and bodywork. What Dreams is it Time to Tend? Jamie Ridler asks viewers this month what we’re dreaming under this Full Pink Moon and what needs tending. Finding the answers elusive I turned to the phrase, “What is Essential to me?” I waited for images and words to surface. I listened for that inner knowing. Each time I’d grasp for a dream, my body would ache and mourn. My dreams of running a half marathon seem elusive as I’m nurturing a back injury, mending, albeit slowly. My dreams of returning to my healing practice as a massage therapist seem elusive as well due to my physical connection. My National Cerification lapsed, and new legislation is pending in the State of Michigan that will require me to re-test. My dreams of building my yoga practice are on hold as I heal from injury. Each time I reach for a goal or dream, I have to edit, shift, breathe, and adaptat. I feel held back by my physical body, medical debt, and the slow healing process. There was a time in my life where I could make a strong intention and make steps toward fulfilling that dream. Now, I tell myself the universe must be trying to tell me something I cannot yet realize. Many years ago I took level 1 and 2 of Reiki. But since so much change has occurred in my life, I felt compelled to participate in a new class. Later this month I will be attuned with Reiki energy and work toward an energetic healing practice. I have left my old “day job” and found a new full-time position. I continue to take photos and develop skills as a photographer. I am able to walk, again, and hike short distances. The plan to move forward will be to honor my body and it’s needs in order to facilitate healing. To allow myself rest and creative outlets. And to listen for what the Creator has planned for me. My dreamboard shows I might be willing to walk, rather than run (at least for now). That it is essential to be outdoors, to have options, choices and adventures. I see a nest with a feather which symbolizes nurturing, safety, and eventual flight. This is hopeful (smile). 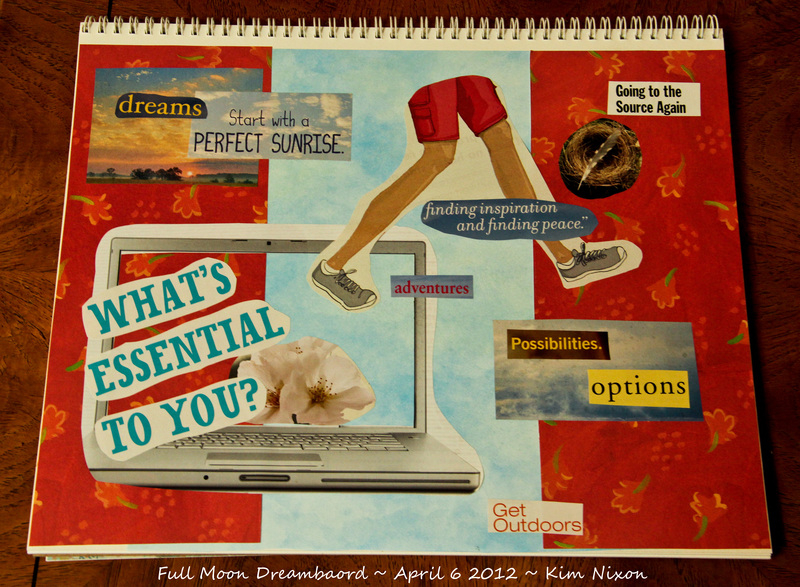 You, too, can join Jamie Ridler, myself and others in making vision boards on the full moon. I desire a life of movement and connection. I want to connect even more with the natural cycles of the Earth and the progression of the seasons. I want to concentrate on my health, body and mind. Part of my journey will be receiving instruction in yoga and movement and then to pass on that training to others. I want to use my knowledge of nutrition for healing and bettering lives. I will return to helping others as a massage therapist. Nature photography, writing, yoga, massage these are the passions I wish to grow in my life. The feeling behind this board is very strong. I’ve been writing poetry again and the birds have been whispering secret knowledge to me (it is not always secret, though. The birds share with those who pause to listen). Our next full moon is March 8, it will be the Full Worm Moon in the Northern Hemisphere. Last night as I gazed out my windows I watched the moon rise full over my year. I knew at 2 a.m. it would officially be the full moon and I could not wait for Jamie’s prompt to start my board. Instead I dove in cutting, trimming, gathering the images that have spoken to me since the New Moon. There were colors, printed papers and textures that called out. By 9 p.m. my board was complete. 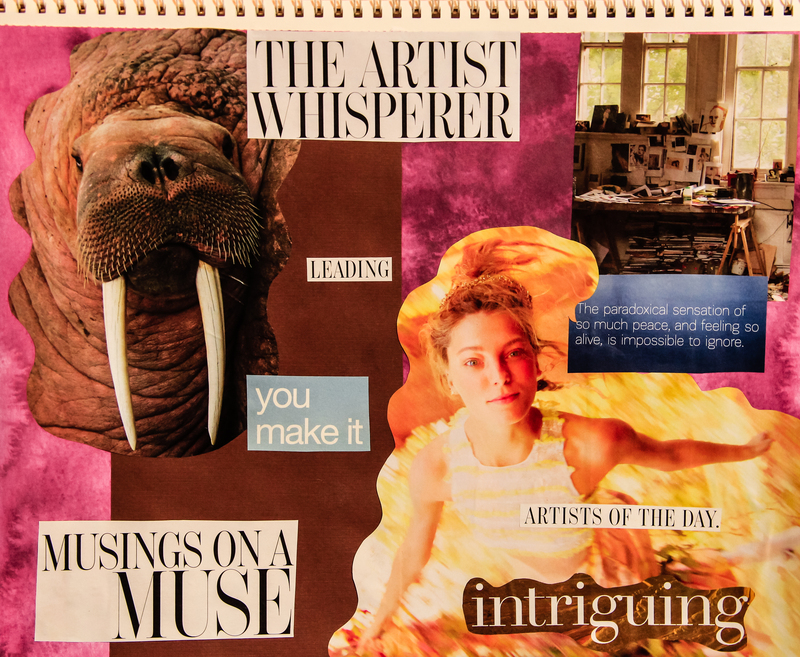 I was eager to hear if Jamie’s prompt would fit my collage. I am hungry for adventure. Big City and Bright Lights. To go further. I dream of a BRIGHT FUTURE! 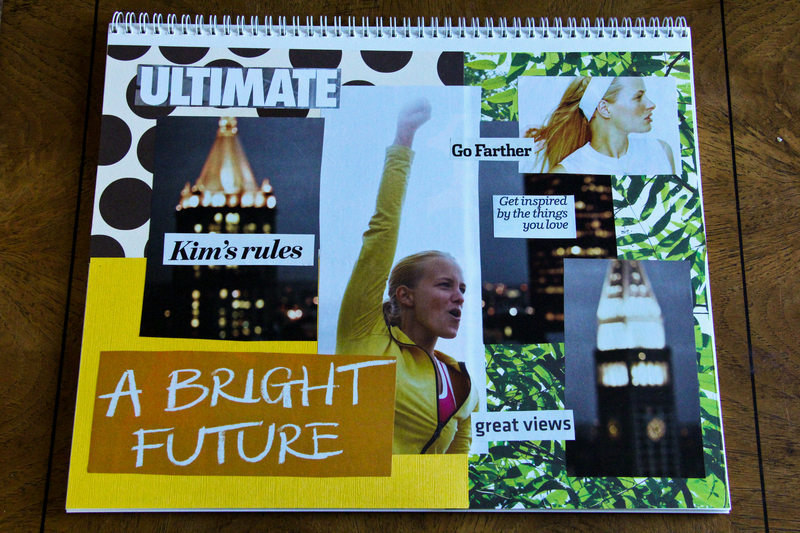 One where Kim’s rules for living are a guiding factor. One of fitness and enthusiasm. One inspired by the things I love. I am in need of great views that spur my fitness and my photography. The word ULTIMATE is bold! I used yellow-gold textured paper, tropical foliage, and brown polka-dots. So along with these city lights from a big city are natural elements, textures, and colors. My earthy nature is present, yet I am being drawn toward something new, fast, sparkling! I am fit, free, and looking forward with gusto! Now I get to take steps toward creating this future. I will be keeping this year’s vision boards in the same Strathmore Windpower Drawing pad, it is made from 30% post-consumer fiber and acid free. The pad is spiral bound, 11×14 sheets, and 80 pound weight. The product is made regionally by a company in the neighboring state of Wisconsin. 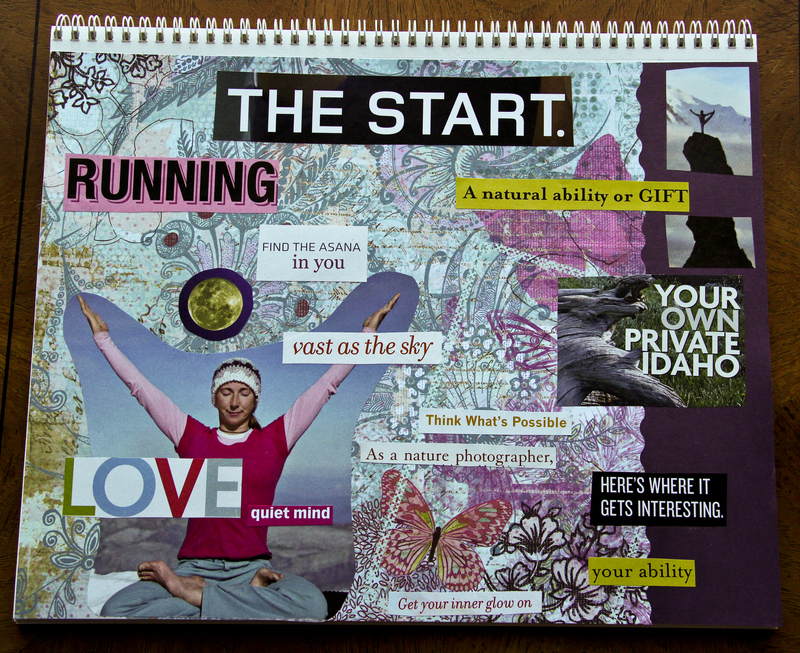 This is my first time starting the practice at the beginning of the year with the intent of completing a collage every month on the full moon. I am working on living an authentic and full life that is powered and inspired by guiding visions and artful endeavours. The next new moon is on my youngest son’s birthday and the next full moon is on my daughter’s birthday. I am anticipating a very powerful moon dreamboard to come of this time.